Known in Turkish as “Beautiful Izmir” the city lies at the head of a long and narrow gulf furrowed by ships and yachts. The climate is mild and in the summer the constant and refreshing sea breezes temper the sun’s heat. Behind the palm-lined promenades and avenues which follow the shoreline, the city, in horizontal terraces, gently ascends the slopes of the surrounding mountains. Izmir is the third largest city in Turkey and its port is second only to Istanbul. 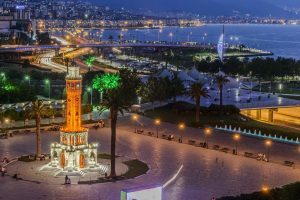 A cosmopolitan and lively city all year round, Izmir bursts with an added vibrancy during the international Arts Festival (June/July) and the International Fair (August/September). For many years Izmir has enjoyed a reputation as a cosmopolitan city of culture. The Izmir Cultural Center hosts opera and ballet performances as well as musical concerts. The city is home to the Aegean Philharmonic Orchestra and boasts a thriving theatrical community. During the annual Izmir International Festival, international and local artists perform at various venues in the city and surrounding area, including the theatre at Ephesus. Take a horse- drawn carriage along the promenade during the day and afterwards spend the evening in the lively atmosphere of the bars and cafes around Kordonboyu, Passport Pier and Karsiyaka. Balcova, on the road to Cesme, is one of Turkey’s largest thermal spas, with excellent facilities for guests.Camalti, 15 km west of Karsiyaka, is an area of coastal marshes and salt fields that is preserved as an important bird sanctuary the – Izmir Bird Paradise. Enthusiasts can spot many species, including flamingoes and pelicans. Belkahve, the highest point above Izmir, overlooks the Gulf of Izmir and is a relaxing spot to enjoy a cup of Turkish coffee. Formerly a favorite haunt of Ataturk’s, it is now the site of the largest statue in his honor. In the village of Birgi is the Cakir Aga Mansion, a fine example of traditional Turkish architecture. The cities of the Seven Churches of the Apocalypse, mentioned by St. John in the Book of Revelation, are all found in Turkey: Efes (Ephesus), Izmir (Smyrna), Bergama (Pergamum), Akhisar (Thyatira), Sart (Sardis), Alasehir (Philadelphia), and Eskihisar (Laodicea). Tours of one to four days can be arranged to see several or all of the churches. Dikili, frequented by cruise liners bringing visitors to Pergamon, is Bergama’s harbor town set in a relaxing atmosphere with many pleasant restaurants lining the Kordon Promenade. Stop at the little port of Candarli, the ancient Pitane, to see the Genoese fortress there, one of the best preserved in Turkey Ayvalik is a charming port, situated amid beautiful pine woods. Nearby, the Seytan Sofrasi (Devil’s Table) offers a splendid panorama of the archipelago along the Gulf of Ayvalik and the little island of Alibey (Cunda), where there are pleasant seafood restaurants. Sarimsakli Beach is one of the most beautiful beaches in the area. “Beautiful Izmir” where Homer of Anatolia, the famous epic author, was born is an important center for tourism, art, culture, trade and industry. The city of Izmir, known for its cheerful, smiling and hospitable people, is a large and important port in Turkey. The delicious and fresh produce of the fertile Aegean plains are exported to the world from here. The first settlement center of Izmir was at Bayrakli in 3000 B.C. and Izmir came under the influence of the Hittite State after 1500 B.C. In the fourth century B.C., Alexander the Great had the citadel constructed, which can be seen at Kadifekale today, and rebuilt the city at the foot of Kadifekale. The city gained importance during the Roman Period and after the Byzantine Period Ottoman sovereignty started. Izmir, which was saved from enemy occupation on 9 September 1922 in the War of Independence, became Turkey’s third largest city in a short period of time. Archaeological excavations still continue in the old town of Izmir at Bayrakli, where Homer lived. The Bayrakli findings are exhibited at Izmir Archaeological Museum. The ruins of the agora and aqueducts at Kizilcullu are works remaining from the Roman Period in the city. The clock tower at Konak Square, which is the center of the city, is the symbol of the city. The tower was built in 1901 by order of Sultan Abdulhamid, for his 25th anniversary of ascending the throne. The clock of the tower was a gift from the German Emperor, Wilhelm II. The tower is 25 meters high, over a base with three marble steps. The largest Ataturk statue in Turkey is at Belkahve, where Ataturk entered Izmir. The old Izmir houses that were restored in a section of the Alsancak District, called Punta, take one into the past of the city. The Kizlaragasi Hani, the most beautiful restored inn in the city, was constructed in the eighteenth century. The monumental portal of the inn, which has more than one thousand rooms on four sides, is on the western facade. The Kemeralti and Kestanepazari Mosques, constructed in the seventeenth century, and the Basbudak, Corakkapi, Hatuniye and Konak Mosques built in the eighteenth century are small and charming mosques located near Kemeralti. The Kemeralti Bazaar is the most interesting and active market place worth seeing in Izmir. Almost everything is sold at this bazaar which is spread over a large area. There are old syna- gogues at Havra Street of the bazaar. The Kulturpark, at the center of the city, is the place where the annual International Izmir Fair is held and attracts great interest. The city is also known for the “International Izmir Festival” which is among the most influential festivals in Turkey. The activities during the festival, in which famous artists participate, are followed with interest. The Cesme Peninsula, located to the west of Izmir, is a large peninsula. There are mountains, forests, numerous beaches, settlement centers, holiday towns and ancient cities in the environs. Urla Wharf and Cesmealti are famous for their beautiful beaches and islands. Balikliova attracts visitors with its fresh fish, and Mordogan and Karaburun with their virgin, untouched shores and nature, where narcissus and hyacinth are grown in the mountains in the wintertime. Cesme, connected to Izmir by a highway, is among the most developed holiday towns in Turkey. There is a large harbor for ferry boats at Cesme, which adopted this name because of the large number of fountains built there during the Ottoman Period. Ferry boat trips are organized from this harbor to Greece and Italy. The splendid Cesme Citadel was constructed by the Ottomans in the sixteenth century. The restored citadel is visited as a museum today. The Kanuni Sultan Suleyman Caravanserai, which was also restored and transformed into a hotel, dates back to the sixteenth century. There are ideal racing courses and coves for yachts to overnight in Cesme, where yachting is also rather developed, with the Altin Yunus (Golden Dolphin) Marina in the lead. An International Song Contest is organized every year at Cesme, famous as the town of festivals and night life. Ilica is a developed thermal spring center close to Cesme. By the long, sandy beaches extending at Ilica, the hot mineral water sources are under the sea, which is not seen anywhere else in the world. There are more than 250 thermal water sources found in Ilica Cove alone. There are beautiful coves around Sigacik, an important yachting center to the south of the Cesme Peninsula. In the neighborhood of Sigacik there is the ancient city of Teos which was the religious belief center of Dionysus, the god of wine. Southeast of Sigacik, Gumuldur, which is known for its beaches and ancient city of Claros with its Temple of Apollo, are points of interest for the tourists. Foca (Phocaea), the holiday town to the north of Izmir, was an important trade center of the ancient world. The Phocaeans, who were also sailors, established trade colonies in various parts of the Mediterrane- an. As a matter of fact, famous cities on the French Riviera such as Marseilles, Nice, and Cannes were founded by the Phocaeans. The song “Marseille” was an old Phocaean folk song taken to France by the Phocaeans, which later became the national anthem of the French (La Marseillaise). There are beautiful coves and islands in the vicinity of Foca. The Siren rocks at the entrance to the Foca harbor are ideal places for sunbathing and diving. Candarli and Dikili are located to the north of Foca. Candarli is worth seeing with its beaches, citadel and ancient city of Pitane. Dikili is an important harbor in the northern Aegean and is known for its beaches.